SEPTEMBER 30: Singler has signed with the Spanish club Obradoiro, Carchia reports. His contract includes an escape clause in case he receives an NBA offer. SEPTEMBER 28: Former Thunder forward Kyle Singler has agreed to terms with a team in Spain, according to Emiliano Carchia of Sportando. However, the deal has not yet been officially announced and the identity of Singler’s new team remains unclear. Carchia hears from a source that Joventut Badalona could be the team signing Singler, since the Spanish club just parted ways with another former NBA forward, Quincy Miller. Carchia also reports (via Twitter) that Singler’s new contract in Spain will include a EuroLeague out. Singler, 30, spent the last three and a half seasons in Oklahoma City, but saw his production and his role decline during his time in OKC. In 2017/18, the ex-Piston appeared sparingly in just 12 games. He was waived by the Thunder for financial reasons last month, with the club eating the $5MM remaining on his contract. Before he began his NBA career, Singler spent time with Lucentum Alicante and Real Madrid as a draft-and-stash player, so he has previous experience in the Spanish League (Liga ACB). 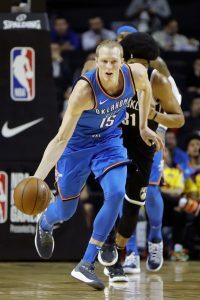 The Thunder’s decision to use the stretch provision on Kyle Singler will result in a savings of about $20MM for the upcoming season, according to Erik Horne of The Oklahoman. The veteran forward was owed $4.996MM in the final season of an extension that was granted in 2015. That money that will now be paid out over the next five seasons, giving OKC a significant reduction in its 2018/19 luxury tax bill, which will drop from $93.1MM to $73.7MM. Singler, 30, spent three and half seasons with the Thunder, but barely played last year. He dropped out of the rotation early and appeared in just 12 games, averaging 4.9 minutes per night. Oklahoma City tried to find a taker on the trade market, but had few first-round picks left to offer. Cutting ties with Singler brings OKC down to 14 guaranteed contracts, along with two-way players Deonte Burton and Tyler Davis. The team payroll is set at $145.5MM, the highest in the league, well above the projected $101MM salary cap and the $123MM tax threshold. There hasn’t been any progress in extension talks between the Timberwolves and center Karl-Anthony Towns, ESPN’s Brian Windhorst said in a recent appearance on “The Jump.” Towns has until October 15 to reach an extension that could pay him up to $158MM over five years. Windhorst speculates that Towns might be considering a shorter agreement rather than a full five-year deal. C.J. Williams, who signed a two-way contract with the Timberwolves in July, is putting his new team ahead of his role with USA Basketball, tweets Darren Wolfson of 5 Eyewitness News. The former Clipper played for Jeff Van Gundy and the U.S. team last September, but will be in Minnesota on Monday when the national team opens training camp in its quest to qualify for the World Cup. The Trail Blazers don’t seem to mind being among three NBA teams without direct G League affiliates, writes Marc Stein of The New York Times in his latest email notebook. Portland once had an affiliate in Idaho and isn’t convinced that it was a valuable investment, Stein adds. However, he notes that G League President Malcolm Turner said this year that he expects all 30 teams to have affiliates within 12 to 18 months, so the Blazers appear ready to give it another shot. As we detailed on Friday, NBA teams have until August 31 to waive players and stretch their 2018/19 cap hits over multiple years. If a player is released after August 31, his current cap hit will remain unchanged, and only the subsequent years of his contract can be stretched. With just a few more days for teams to stretch 2018/19 salaries, Thunder swingman Kyle Singler looks like the top candidate to be waived this week, as ESPN’s Bobby Marks notes (via Twitter). Three factors are working against Singler and making him a prime release candidate. For one, he fell out of Oklahoma City’s rotation entirely in 2017/18, appearing in just 12 games and playing only 59 total minutes for the season. Secondly, he’s essentially on an expiring contract, since his $5.3MM+ salary for 2019/20 is non-guaranteed. And finally, the Thunder currently have the largest projected tax bill in the NBA, meaning waiving Singler could create substantial immediate savings for the franchise. Currently, the Thunder have a total team salary of $149.58MM, with a projected tax bill of $93.19MM. If they were to waive Singler, who has a $4,996,000 salary, they could stretch his cap hit across five seasons due to his non-guaranteed second year, reducing this season’s cap charge to just $999,200. That would bring the Thunder’s team salary down to $145.58MM and their projected tax bill to about $73.79MM, creating $23MM+ in total savings. Outside of Singler, there aren’t many obvious stretch candidates around the NBA. Other projected taxpayers could consider similar moves to save some money, but many of those clubs don’t have players on expiring contracts that they’d want to release. The Wizards, with Jason Smith and his expiring $5.45MM salary, may be one team to watch. Another motive for a team to stretch a player’s 2018/19 salary would be to open up more cap room. However, there aren’t many clubs that can create meaningful cap space at this point in the offseason, and there’s little incentive to do so anyway, given the lack of players worth spending it on. The Kings (Iman Shumpert or others) and Suns (Darrell Arthur or Tyson Chandler) could open up a chunk of cap room by stretching well-paid veterans, but I’d be surprised if they cut into their projected space for 2019 and/or 2020 by doing so. After four disappointing seasons, former lottery pick Nerlens Noel has a chance to revive his career with the Thunder, writes Ben Nadeau of Basketball Insiders. Oklahoma City was aggressive in its pursuit of Noel, including phone calls from Russell Westbrook and Paul George in the opening minutes of free agency. He agreed to a two-year deal worth nearly $3.7MM that contains a player option for next summer. Noel has a lot to prove after being the sixth player taken in the 2013 draft. He was stuck in a center logjam in Philadelphia before being traded to Dallas midway through the 2016/17 season. Injuries limited him to 30 games in his only full year with the Mavericks, and he welcomes the chance for a fresh start with the Thunder. The current Thunder roster is heavily imbalanced with wing players, notes Berry Tramel of The Oklahoman. This week’s signing of Hamidou Diallo gives OKC 15 players under contract, with eight of them being wings. That includes Kyle Singler, whom Tramel expects OKC to use the stretch provision on if it can’t find a team willing to take him in a trade. Singler has two more years and about $10.3MM left on his contract. The team has just two centers and two power forwards, raising concerns about depth at both positions. Trail Blazers fans deserve an explanation for how the team is handling its assets, writes John Canzano of The Oregonian. The latest puzzling move was letting a $12,969,502 trade exception from last year’s Allen Crabbe deal expire. Canzano retraces a history of questionable decisions, including mega free agent offers to Roy Hibbert, Greg Monroe and Chandler Parsons, who all signed elsewhere, and large contracts for Evan Turner, Festus Ezeli and Meyers Leonard that have clogged Portland’s cap space. The Timberwolves have an extension decision to make this summer on Tyus Jones, notes Derek James of 1500 ESPN Twin Cities. Coach Tom Thibodeau has promised Jones more playing time in the future, but that could be difficult to deliver with Derrick Rose returning and Josh Okogie as the team’s first-round pick. In the wake of losing All-NBA defender Andre Roberson to a ruptured left patellar tendon for the remainder of the 2017/18 season, the Thunder are interested in trading for newly-acquired Clippers guard Avery Bradley, reports Tim Bontemps of The Washington Post. Bradley, who is in the final year of his contract, likely doesn’t fit into the Clippers’ long-term plans, and Oklahoma City appears interested in taking advantage of a potential deal as a result. Long considered an elite man-to-man defender in this league, Bradley would be able to step in for Roberson admirably, while at the same time giving the Thunder an upgrade on the offensive side of the ball, where Bradley is a career 36.8 percent shooter from long range (Roberson’s career three-point percentage is 25.7%). Despite the Thunder’s interest, however, it’s difficult to envision a plausible scenario in which a potential trade would occur. The Clippers are building for the future and the Thunder don’t have a first-round pick to trade until 2022 at the earliest. Also, Bradley is making $8.8MM this season and the Thunder’s best pieces for salary-matching purposes include some combination of Alex Abrines, Patrick Patterson, and Kyle Singler, none of whom are on an expiring deal or overly productive. The Thunder would likely have to throw promising rookie Terrance Ferguson into any plausible deal in order to realistically pique the Clippers’ interest, and the Thunder are thus far unwilling to do so, per Bontemps. The addition of Paul Millsap will give the Nuggets an established defender capable of helping the franchise improve its efforts on that side of the ball, Buddy Grizzard of Basketball Insiders writes. Last season Denver sported the second-worst defense in the NBA. Grizzard suggests that Millsap’s “humble-yet-forceful” personality could bring out the best in his Nuggets teammates, including Nikola Jokic who already opted out of EuroBasket 2017 to focus on more individual workouts. Millsap’s efficient low-post game will give Jokic yet more of an opportunity to showcase his playmaking abilities while the versatile Jokic gives Millsap his most skilled frontcourt partner since Al Horford. He may not be the final piece that the Nuggets need to contend, Grizzard writes, but he certainly fits into the right puzzle. The Thunder elected not to waive Kyle Singler at the stretching deadline yesterday. While that may not mean he’s in for a big role in 2017/18, the veteran forward’s contract could be a valuable asset to include in a mid-season trade, Brett Dawson of The Oklahoman writes. It’s no sure thing that Royce O’Neale will stick with the Jazz this season – the club currently has 16 guaranteed contracts – but the franchise saw enough in the versatile wing to offer him a three-year contract with the first season guaranteed earlier this summer. Benjamin Mehic of the Deseret News broke down the 24-year-old’s long journey to the NBA. A knee injury sidelined Jazz guard Alec Burks in the middle of last spring’s postseason but the 26-year-old is back at full health. Tony Jones of the Salt Lake Tribune tweets that Burks will be ready to go without restriction at training camp. NBA teams have about two more weeks to apply the stretch provision to the 2017/18 cap hits for players they waive. After August 31, teams will no longer be eligible to stretch salaries for the coming season, and the stretch provision will only apply to future seasons on a player’s contract. The stretch provision is a CBA rule that allows teams to stretch a player’s remaining salary across additional seasons. For July and August, the rule dictates that a team can pay out the player’s salary over twice the number of years remaining on his contract, plus one. So a contract with three years left on it could be stretched out over seven years. After August 31, only the future years on the contract can be stretched in that manner. In some cases, it can be advantageous to wait until September to waive a player and use the stretch provision. If a team isn’t close to the tax line and can’t clear additional cap room by stretching a player’s current-year salary, it may make more sense to be patient, since that extra immediate cap room wouldn’t be useful. Including Nicholson’s name in this list is perhaps the equivalent of getting the middle square for free in a game of bingo. After all, ESPN’s Adrian Wojnarowski reported last month when the Trail Blazers acquired Nicholson from the Nets in exchange for Allen Crabbe that the veteran forward would be waived and stretched. It’s somewhat odd that it still hasn’t happened, but there’s no reason why it shouldn’t, unless Portland finds a way to include Nicholson’s contract in another trade. If and when the Blazers make it official, their total guaranteed team salary will move to within $2MM of the tax line, which is impressive for a team that appeared last month to be on its way to accruing massive taxpayer penalties. In an era when nearly everyone turns down their player options, the Bucks had two players opt in this offseason. Greg Monroe‘s option is worth nearly three times as much as Hawes’ and Monroe remains a key part of Milwaukee’s rotation, so stretching Monroe isn’t practical. But Hawes is another story. Hawes, acquired in a February trade, played sparingly for the Bucks down the stretch last season, and is unlikely to have a major role this year either, with Thon Maker poised to take on more responsibility at the center position. Hawes’ deal has one year and about $6.02MM left on it, so stretching it would free up over $4MM on this year’s cap. That $4MM difference could be crucial for the Bucks, who are currently just barely over the tax line. The trade that sent McRoberts to Dallas was a pure salary dump for the Heat, who needed to clear some cap room to finalize new deals for James Johnson, Dion Waiters, and Kelly Olynyk. As a result, the Mavs received $5.1MM in cash in the swap, more than enough to cover the difference between McRoberts’ salary and A.J. Hammons‘ figure. Having already essentially been paid enough money to cover McRoberts’ salary, the Mavs are under no pressure to keep the veteran forward on their roster if they don’t expect him to have a real role. Dallas hasn’t shown a willingness to splash around in free agency this summer, but if the team wanted to make a run at a restricted free agent, stretching McRoberts’ $6MM salary would create an extra $4MM in cap room, giving the Mavs the ability to get up to $15MM+ in total cap space, even without renouncing Nerlens Noel‘s cap hold. The recipient of a five-year, $25MM deal in 2015, Singler has not lived up to that contract for the Thunder so far. After making 37.8% of his three-point attempts in his first three seasons, the former second-round pick has made just 27.6% over the last two years, and averaged a career-low 12.0 MPG last season. Oklahoma City is currently projected to be a taxpaying team, with about $126MM in guaranteed salary on the club’s books. Waiving and stretching Singler’s multiyear deal wouldn’t get the Thunder out of the tax, but it would trim team salary by more than $3MM and reduce the franchise’s projected year-end tax bill by another $5MM or so. On paper, Pondexter is exactly the sort of player the Pelicans desperately need. His outside shooting ability would help the team space the floor when Anthony Davis and/or DeMarcus Cousins are on the court, and playing with point guards like Rajon Rondo and Jrue Holiday could set him up for easy scoring opportunities. With one year and about $3.85MM left on his contract, Pondexter is hardly an albatross, and if there’s a chance he can contribute, he should be retained. But New Orleans is within about $1MM of the tax line, so stretching Pondexter’s salary could help give the team a little more breathing room to acquire additional reinforcements. Russell Westbrook can sign a supermax Designated Veteran Player Exception deal with the Thunder worth over $235MM over six years, which would make him the highest paid player in NBA history. However, money is not the determining factor over Westbrook’s future, Erik Horne of The Oklahoman writes. For starters, uncertainty surrounding the Thunder’s roster in future seasons makes Westbrook signing a longterm contract uncertain — despite the Thunder being optimistic it will get done. As Horne explains, Westbrook does not have the option to sign another shorter-term pact like he did last year, signing a three-year, $85.7MM extension. As Horne mentions, under the new collective bargaining agreement, Westbrook cannot extend his current deal unless it’s a five-year max: meaning it’s max or nothing. The reigning Most Valuable Player has set himself up to be paid handsomely — whether it is this offseason or next, when he can hit free agency and pursue other options. Westbrook will earn $28.5MM in 2017/18 but that could prove to be chump change if and when he signs a longterm max deal. In separate piece for The Oklahoman, Horne suggests that Kyle Singler may be an optimal candidate for the stretch provision. The 29-year-old has averaged less than four points per game in Oklahoma City in two seasons and is owed $9.66MM over the next two seasons. To save cap space, the stretch provision could stretch out Singler’s salary over seven seasons and open up a roster spot for the Thunder, Horne notes. Once again for the Oklahoman, Horne answers four key questions surrounding the Thunder. Among the burning questions include when 2017 draft pick Terrance Ferguson will sign, if and when the Thunder hires a new assistant coach, if any additional moves will be made, and Westbrook’s aforementioned contract dilemma. Michael Rand of the Star Tribune looks at five potential free agent signings for Minnesota. On the list are three players who have connections to head coach Tom Thibodeau (C.J. Watson, Mike Dunleavy, and Tony Allen) and two productive veterans (Anthony Morrow and Andrew Bogut). Justin Zanik and David Morway are joining the Jazz as high-ranking front office executives, according to ESPN’s Adrian Wojnarowski (via Twitter). Ryan McDonald of Deseret News breaks down the move and provides information on both men and their ties to Utah. The Timberwolves are formally interviewing a number of prospects this week at the draft combine in Chicago, including Kentucky’s Bam Adebayo and UNC’s Justin Jackson, per Darren Wolfson of 5 Eyewitness News (Twitter links). Minnesota is in line for the No. 6 pick heading into the lottery — Adebayo and Jackson aren’t expected to be selected that high, but the team is doing its due diligence. Kyle Singler has two more fully guaranteed years left on his contract with the Thunder, but his future with the franchise remains unclear, writes Brett Dawson of The Oklahoman. As Dawson notes, Singler was virtually non-existent for Oklahoma City this past season, and will be a candidate to be traded or waived. If the Jazz were to re-sign key free agents like Gordon Hayward, George Hill, and Joe Ingles, they’d likely remain a top-four team in the Western Conference going forward, says Brad Rock of The Deseret News. However, given how quickly the club was dispatched by the Warriors, Rock believes it will take more than standing pat for Utah to move toward legit title contention. With Hill and Shelvin Mack facing free agency and Dante Exum and Raul Neto entering the final year of their respective contracts, the Jazz will face some tough decisions at the point guard position this summer, as Mike Sorensen of The Deseret News details.